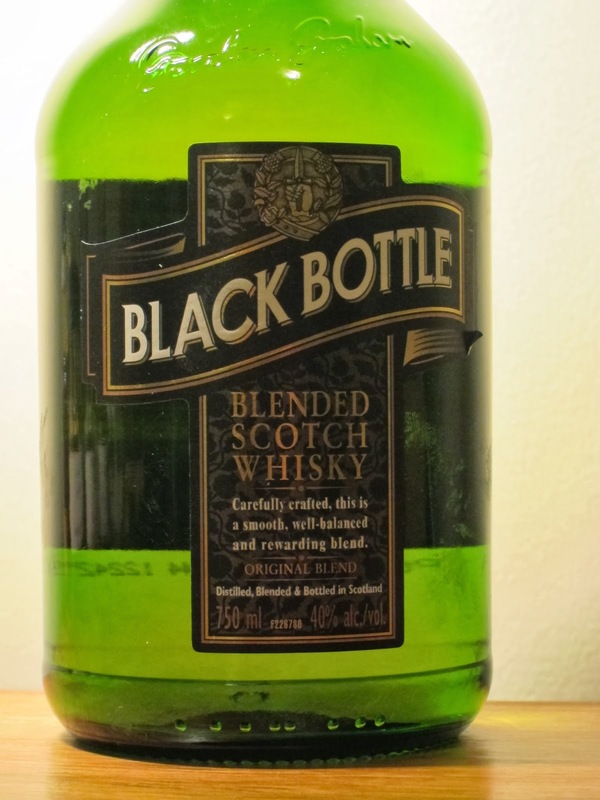 Black Bottle (40.0%): Black Bottle used to be one of my favorite budget blends... Honestly I still think that it is unbeatable with the price tag of $17.99. I reviewed it back in November 2010 with other whiskies in the same category under the title Sipping Cheap but this whisky definitely deserves to be reviewed more in depth for the Blend Project. It is another expression by Burn Stewart Distillers who also blends Scottish Leader I reviewed almost a week ago. Actually they came up with a new hip bottle design last Fall but I didn't see it on shelves in US yet. This is probably one of the last old school cute chubby bottles you can find around. I don't exactly know if the recipe has changed with the new packaging but I will try as soon as I can put my hands on one. We already knew that the whisky contained Islay malts but the label makes it clear that the blend contains Highland, Speyside and Lowland malt and grain whiskies as well. Let's see if it is still the best bang for the buck... Color: Yellow gold, light amber. Nose: Sigg water bottle, bartlett pears and winter ocean spray. Young grain whisky, nori, and subtle peat aromas accumulating in time. It gets sweeter with tutti frutti cake, green gummy bears and buttermilk candy. Palate: Again grain whisky is leading with nice creamy texture, soot and fireplace smoke. Dandelion leaves, kumquat zest and cardamon. Peat is forming again with time but definitely not aggressive despite its reputation. Adding a few drops made the texture thinner but pushed the peat notes up a notch. Finish: Medium long with ash, cracked black pepper corns and green wood. Overall: It tastes younger than I remember and with heavier grain whisky influence but still very enjoyable. Another great budget blend from Burn Stewart Distillers. On the other hand we are talking about $17.99..! I wouldn't dare to complain anything about it. One of the best bargains of the whisky world but is it a better choice than the White Horse for peat freaks? I am not quite sure... I should think about it a little more. We have more whiskies waiting to be reviewed for the Blend Project before I start to think about the top five anyway.